"God's presence is there in the scrubbing, in the working, in the common doing." Who has ascended into heaven and descended? Who has gathered the wind in His fists? Who has bound the waters in His garment? Who has established all the ends of the earth? What is His name, and what is His Son’s name, if you know? Probing questions, reminiscent of Job. Who? Certainly not me! In this hour, where Darkness is increasing, the only thing we need is to know the God who rules the wind and waters to the end of the earth. To know Him, not intellectually, but to know His name and His Son’s nature, identity and power. To know Them face to face, heart to heart. 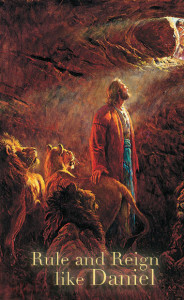 I deeply believe this is Daniel’s hour to ‘rise at the end.’ And this was his secret: he knew the name and names of God, ever increasing, ever adjusting TO that Name! It requires the deepest humility to comprehend this present reality: we have NO power, NO understanding, and NO ability. We have only one possession, one safety: We need to KNOW His name and the name of His Son. Knowing Him intimately and in reality, knowing Him as He is, brings every answer and all Faith! And we are given that privilege as a promised, signed-in-Blood covenant gift: “For all will know Me, from the least to the greatest of them…” (Heb. 8:11).